Hollandia is easy to find, situated only about a mile from exit 8, and about a half mile from Blue Jay Orchards. Follow Route 6 (Stony Hill Rd) to Old Hawleyville Rd. 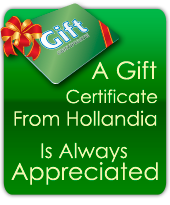 Hollandia Gift & Garden is on Stony Hill Rd, just past Big Y, about one mile from exit 8. To get to Hollandia Nurseries & Gardens, turn right on Old Hawleyville Rd and follow for about a mile. Just look for thousands of flowers on the left. Winter Hours: 10 a.m. - 4 p.m., daily.